Every cuisine has a quintessential stew, a slow-cooked “stuff, usually meat, in sauce, in a pot” that varies regionally and engenders both deep nostalgic love and endless debate. Pot-au-feu in France, soondubu jjigae in Korea, adobo in the Philippines, feijoada in Brazil, borscht in Ukraine; the list could be much longer. America has its own version, a dish beloved by all, yet usually overlooked in “national dish” conversations in favor of the hamburger. Chili is, I would venture, America’s true national dish, a remnant of the Wild West that relies on indigenous plants (chile peppers, tomatoes) and America’s favorite protein, beef. But what happens if you don’t want to eat meat? Part of the delight of chili con carne is that the dish seems to require argument, especially from Texans, who think they invented the dish (nobody knows who invented it, and it may well have been in New Mexico or Arizona or California or even, possibly, in Mexico). Does it include beans? No, say Texans, loudly. Does it include tomatoes? No, say Texans, sometimes, but on the occasions they do say it, they also say it loudly. Does it include cheese? Can it have white chicken? 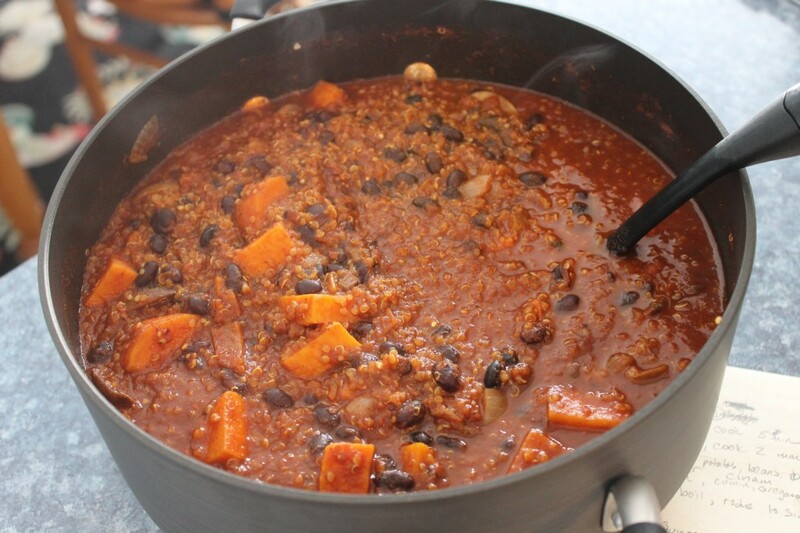 And even more to the point: Is vegetarian chili even a chili at all? The problem with removing meat from chili is that the most traditional chili recipes — the strictest observance to which nobody could have an objection — produce something more like a beef curry with different spices than anything else. It’s little more than slow-cooked, fatty meat, often browned in beef suet, in various dried and fresh chiles. (Style guide: “chile” is the pepper; “chili” is the dish; “Chile” with a capital C is the country.) The entire dish is meat, in spiced meat-sauce. It is not possible to replicate this flavor without meat, and it would be folly to try. But thanks to pre-made pouches of stale chili spice mixes, the taste memory of chili, to most Americans, is not the specific dish of loud Texans. Instead it is stewed tomato with dried chile and cumin. Now that we can work with! To replace the flavor of meat, I tend to lean on other strong flavors: acid, smoke, spice, and herb. Vegetarian chili should not taste like chili con carne sin carne; it should taste like its own creation, a dish that has been thought through to exist on its own and not as a dish you eat when you can’t have the real thing. Rule number one in making chili of any sort is to never, ever use the packet of pre-made spice blend. It is almost certainly stale, but I have less of an issue with that than with the lack of control you have over the particulars of your chili. The spices in this dish are probably the most important part; do you really want to trust the dark red spice that comes in a ninety-nine-cent paper pouch? So the first step is to make your own chili mix. Essentials are some sort of dried chile pepper, cumin, paprika, dried oregano, and dried coriander. It would be best to do this entirely from scratch. Your local grocery store will likely have some dried chiles, or you can find them at most ethnic markets (Mexican is best, since chili has such a heavy Mexican influence, but most Asian, Caribbean, and Indian markets will have everything you need as well). The basic procedure for making your own chile powder is to tear out the stem and seeds of dried chiles and toss them in a dry, medium-hot cast iron pan for a couple minutes, flipping a couple times, until pliable and fragrant, then blending somehow. (A cheap coffee grinder is best, though you probably won’t be able to use it to make coffee after this. If you’re doing this a lot, it’s worth it to have a separate grinder for spices; they cost like twelve bucks.) After you grind it, don’t take the lid off for a minute or two; grinding will have churned up a bunch of dust that has to settle, and if you breathe it in you will very much regret it and be turned off the whole process. Do the same toasting and grinding with a bunch of whole cumin seeds and combine with paprika (this stuff is fine to get already ground), dried oregano (don’t bother drying your own) and coriander. The specific chiles are a matter of personal taste, but it’s worth it to use several. (I know that this is not an easy recipe. This is grandma cooking, old-school stuff, and is going to require a lot of work before it tastes right. The nice part about this is, first, it’s fun, and second, you get to eat a lot of chili as you figure out how to do this.) The aim here is to build flavors upon flavors, getting the right blend of sweet, smoky, spicy, and fruity. This is complicated by the fact that chiles can vary tremendously from pepper to pepper; one may be mild, and the next may be searingly hot. You just have to kind of taste and see what you like. (For an easier version, you can just use pre-ground chiles as long as they’re good quality. An easy way to tell is if the specific kind of chile is listed; if it just says “chile,” or worse, “chili” powder, avoid. If it says “ancho chile powder,” it’s probably pretty good.) I typically use a mix of ancho for fruitiness, guajillo for umami and smoke, and chile de arbol for heat. This is a good guide to the basics, but you have to kind of play around and see what you like. Chipotles are often standard, for example, but I find them too aggressively smoky for a vegetarian chili; they blow out the more mild flavors of the vegetables. Play around! Once you’ve toasted and ground and mixed your chiles and cumin, add in the dried oregano and coriander to taste. There are plenty of other things you can add; cinnamon is a good one, as is clove or allspice or turmeric or even dried lemon peel. Make your first few chili blends in small batches so you can play around with them and see what you like and what works. Now for the easy part: the cooking. This is how I usually do it. Chop a yellow onion, a few cloves of garlic, and fresh chile peppers, then throw them in a heavy-bottomed pot of some sort — a soup pot or dutch oven — with some olive oil. I prefer to go very mild with the fresh chiles; the heat is going to come from the dried chiles, so we just want to add a bit of fruitiness with the fresh ones. (Do not use bell peppers. Bell peppers are extremely sweet and also are gross when soft. Bell peppers are the Wonderbread of chiles.) Anaheim and poblano are both good ones for this. Cook that down until the peppers are soft and the onions translucent, then add a heaping tablespoon of your very impressive chili blend. Stir to coat, and let it cook for another few minutes, getting all toasty and aromatic. Some of your onions and chiles will stick to the bottom of the pot. This is good! Don’t worry about it. Pour in a glug of beer (lean toward hoppier beers, but don’t use the nutso extremophile IPAs with clever names like InHOPerable Brain Tumor) to deglaze, and scrape the stuff off the bottom of the pot with your spatula. Then dump in a can of tomatoes. (On the subject of tomatoes: I mostly use the Cento brand, because they are excellent and the yuppie grocery store down the block sells them. I like to get the whole tomatoes, with no herbs or anything added, and then chop or blend them myself to get the texture I want. Some people like chunks of tomatoes in their vegetarian chili. I don’t, really, so I just open the can and shove in my immersion blender and blend them all up. But do what you want.) Let the them cook down for awhile, removing that raw tomato flavor and getting all friendly with the spices you so lovingly prepared. This may take forty minutes or an hour. Near the end of cooking, add in your beans. If you want to cook them from their dried state, soaking overnight, the whole deal, that’d be great; it’ll taste better. If you just use a drained can of Goya beans, that’s fine too. Also add in a drained can of whole kernel corn. Yes, a can: fresh corn in January is offensively bad, and canned fresh corn is usually really sweet and delicious. Cook for another few minutes to warm the corn and beans. Serve with a wedge of lime, chopped cilantro, a chopped avocado, and cheese if you want. You should go for a fresh cheese here, like queso blanco or farmer’s cheese. Feta will work very well as a substitute if you can’t find that stuff. You can eat it over rice, or grits, if you’d like. Chili is a perfect learning experience for a cook because it can require lots of pretty advanced techniques — learning to toast your own spices, figuring out how to distinguish between chiles, and how to balance all these flavors. But it’s only as difficult as you want to make it; if you use pre-ground spices, this whole thing can be done in like forty-five minutes, but if you want to rehydrate your own beans, craft your own perfect spice blend of the perfect variety of dried and fresh chiles, it can be one of those dishes you keep coming back to, keep adjusting and trying new things. Maybe this time you’ll try chocolate! Or white wine! Or some weird new kind of chile you found at the Chinese market! Oh and it’s good for the Super Bowl, right? People eat chili while watching the Super Bowl. Crop Chef is a column about the correct ways to prepare and consume plant matter.